The controversial question has been asked before over and over again. Was the avart garde painter, Salvador Dali, whose museum is in St Petersburg, Florida (see HERE for museum's location, hours, and current exhibits), gay? 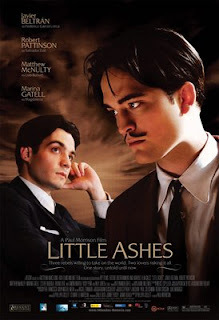 A new film in English, "Little Ashes," makes this argument even though many historians and critics argue it is an audacious and baseless claim. And Dali himself has denied that claim, though he admits that Frederico Garcia Lorna, the well-known Spanish writer and close friend, was drawn to him. Read HERE for the movie's website. To get to the right page, click at the very below, where is says "Reeltime Creative." Then click the name of the movie, and you will see a trailer for it. Below is a synopsis of the film taken from the website. This film is scheduled for worldwide release in 2009. In 1922, Madrid is wavering on the edge of change as traditional values are challenged by the dangerous new influences of Jazz, Freud and the avant-garde. Salvador Dali arrives at the university; 18 years old and determined to become a great artist. His bizarre blend of shyness and rampant exhibitionism attracts the attention of two of the university's social elite - Federico Garcia Lorca and Luis Buñuel. Salvador is absorbed into their decadent group and for a time Salvador, Luis and Federico become a formidable trio, the most ultra-modern group in Madrid. However as time passes, Salvador feels an increasingly strong pull towards the charismatic Federico - who is himself oblivious of the attentions he is getting from his beautiful writer friend, Margarita. Finally, in the face of his friends' preoccupations - and Federico's growing renown as a poet - Luis sets off for Paris in search of his own artistic success. Federico and Salvador spend the holiday in the sea-side town of Cadaques. Both the idyllic surroundings and the warmth of the Dali family sweep Federico off his feet. Salvador and he draw closer, sharing their deepest beliefs, inspirations and secrets, convinced that they have found a kind of friendship undreamt of by others. It is more that a meeting of the minds; it is a fusion of souls. And then one night, in the phosphorescent water, it becomes something else.